Now that’s what I call leftovers! Time is moving on quickly, and it won’t be long before we move onto a different country. 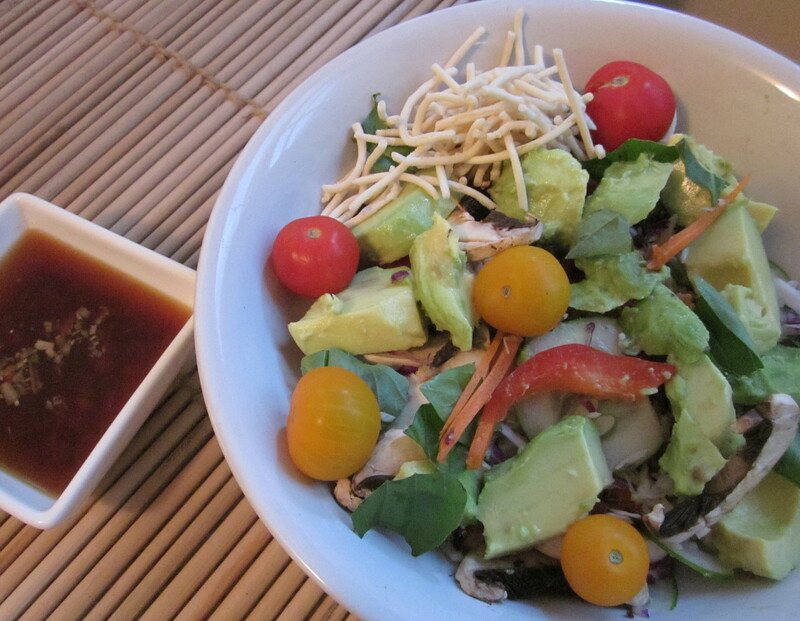 In the meantime though we’ll just keep on enjoying all this delicious, fresh food! It’s the height of summer here, every day is pretty hot, but today was just that bit hotter, so neither of us was keen to sweat it out in the kitchen. Thankfully we had enough leftovers to feed us tonight. Another hot, humid day was in the works, and our tiny kitchen is easily the hottest room in the house. No one really wants to be cooking in there when it’s hot. Unless of course you’re keen on cooking in a sauna. So I chose to get in quite early before things heated up too much and do some meal prep. 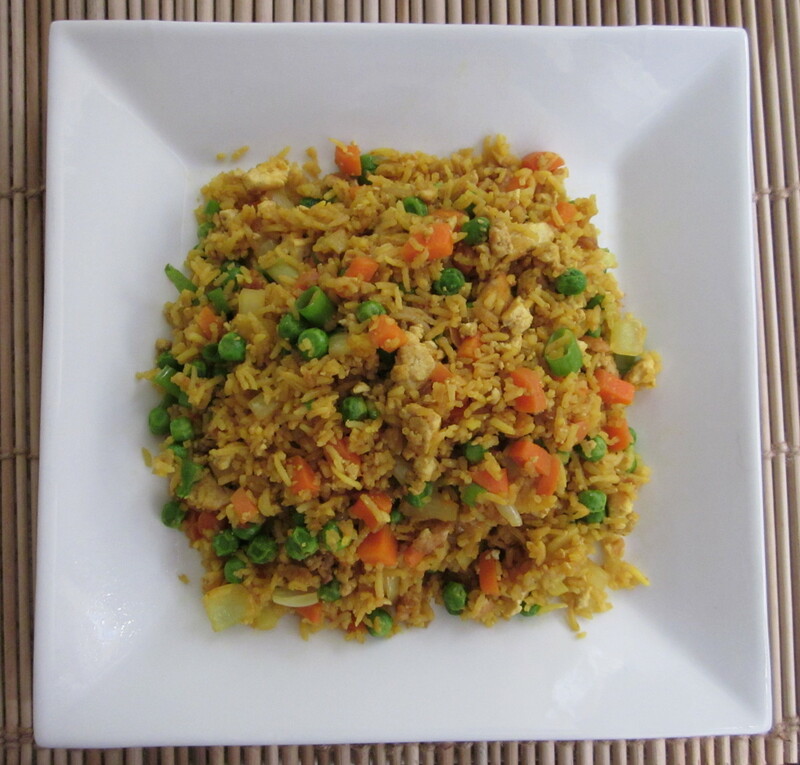 I decided to cook one dish, Turmeric Fried Rice, which wouldn’t take very long, and make two salads. One was a Green Curry Noodle Salad, and the other was a Colourful Vegetable Salad with a rather spicy but fairly traditional Thai dressing. Instead of putting the salads together in the morning I chopped up all the vegies and stored them in separate containers ready to be put together later. 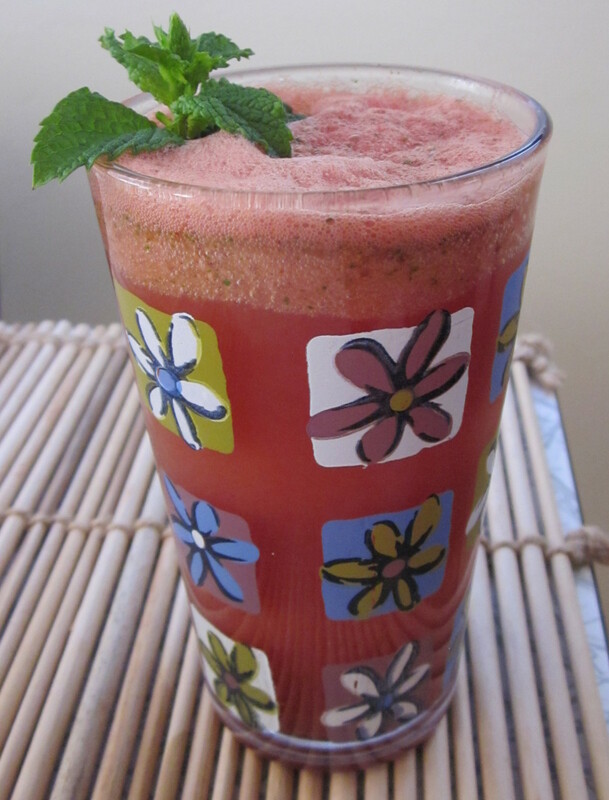 My other creation was a Watermelon Cooler – watermelon, dates, mint and lime juice. Half cooler, half soda water, served over ice. Super refreshing! You guessed it, another hot, steamy day. We went to the markets in the morning, leaving with a basket loaded full of fresh vegies. In the afternoon we took the pups to a nearby coastal town, where it was cooler, for a run in an off lead park. Sadly the beach is out for the moment as Willow has stitches from having a small benign lump removed. Steve decided to brave the steamy kitchen early in the evening, and make a batch of Mushroom Satay. I selflessly let him. He made Mushroom and Tofu Satay earlier in the month and was keen to make it again. Yum! 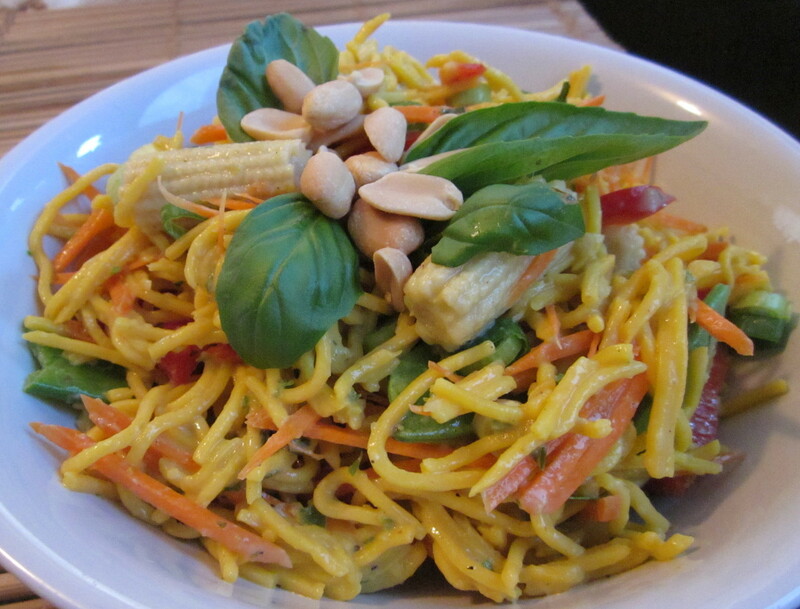 We had it with leftover Turmeric Fried Rice and Green Curry Noodle Salad. 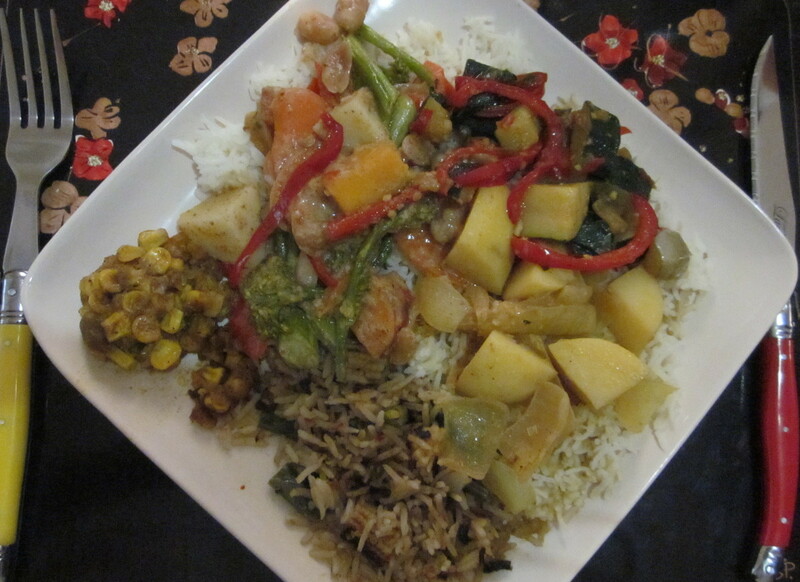 It was great coming home to find Steve had already made a Green Curry, and was going to make a Massaman Curry too! There’s just no such thing as too much curry. We now have some Red, Green and Massaman Curry pastes stored in the freezer, ready to use whenever. An ice-cube tray is a great way to freeze them. We didn’t have a spare one so we just laid out tablespoons of paste into the bottom of a plastic container and put that in the freezer. Even though it was a cooler day, we decided it might be better just to finish off most of the leftovers we had, rather than make more. Back to cooking tomorrow!